We gathered on a Thursday. Shango’s day. Jupiter’s day. A time for expansion and commitment to long term goals. We brought our children, notebooks, pregnant bellies, curiosity and love. We came hungry for each other and knowledge. We gathered in a warm safe home in the evening. And we made magic. Something amazing happens whenever brown women come together with a particular goal. We don’t messily charge at it nor tip toe around our purpose. We reach it in waves, some big some small, but always consistent. We follow the energy and rhythm of the moment. We hold space for laughter and tears and encourage them both. Theres a impalpable feeling that comes with being so free amongst long lost relatives. There were many different nations present and the our ancestors filled the space joyfully. Mexicana, Meso American, African by way of turtle island, Kanaka Maoli, Philippina, Native American, Chinese…we were colorful, vibrant and purposeful. How blessed we were to be guided to that central place so that we could heal and honor our lineages. The first night was spent setting the tone and asking important questions. How did we want to feel by the end of this training? What were we here to learn and witness? Most of our responses were similar. We wanted to feel confident, powerful, connected and knowledgable. We wanted to walk with conviction in our path as mothers and birth workers. We find ourselves in a world that does not honor intuition and ancestral wisdom. We need to be fierce in order to face this society and support healthy, transformative free birth. Centuries of colonization, displacement, slavery and genocide has left our modern people with cultural amnesia. Memories of our traditions are locked into our DNA but still, it feels like its at the tip of our tongue. A word we can’t quite remember but we recognize the feeling it gives us. 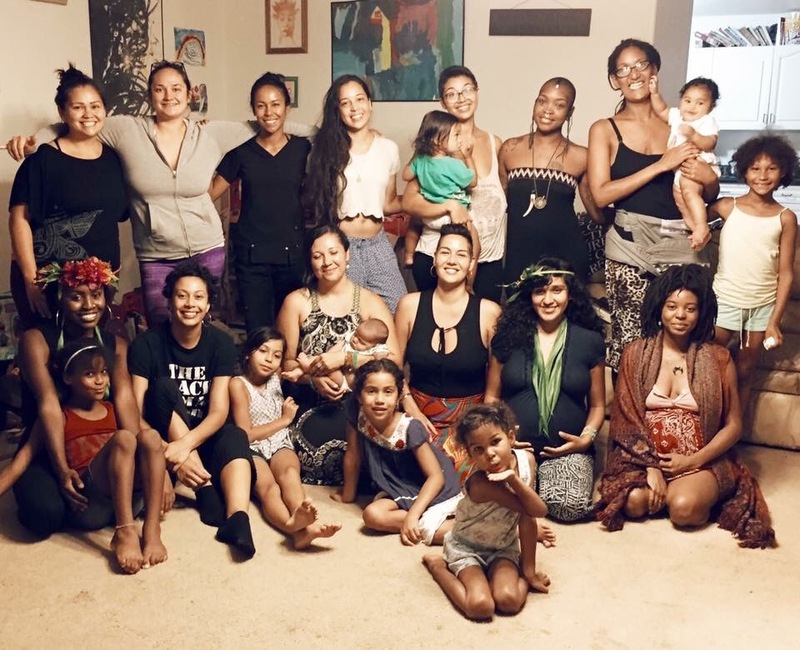 The intention of our teachers was not only to give us practical skills and knowledge to aid in pregnancy and postpartum care, but to get in touch with that feeling and pull out the ancestral wisdom we all carry deep in our bones. The training was lead by two powerful and beautiful women. I was extremely excited to meet Panquetzani of Indigemama: Ancestral Healing. I’ve been following her on social media for years, listening to her podcasts and reading her insights. She was trained in the most traditional way, from her abuelitas in her home country. Panquetzani has been doing womb wellness and birth attendant work for her community in southern California for years. She offers online courses, workshops and healing sessions throughout the US. Panquetzani blessed us with her extra potent magic this visit as she is hapai (pregnant) with her third child! Sumayyah of Sumi’s touch is a midwife based in Oakland. She and her mentor Andrea Ruizquiez form the mighty team Oakland Partera which serves mostly LGBT people of color in the area. As a woman of African descent, her role as a midwife is of the highest importance. Currently, Black women and birthers are 3-4 times more likely than White women to die while giving birth and with the postpartum care due to systematic racism and negligent care. The infant mortality rate for black infants is also high. Modern midwifery is overwhelmingly White and clearly there is a desperate need for Black and Brown midwives as we make up only 5.8% of the field! Hope is not lost. We have heard the call and Women of Color throughout the US are inspired and dedicated to writing a different story. Thankfully, we had a few Kanaka Maoli women present, so we were blessed to open with Oli (Hawaiian chanting) before each session. The voice and breath is extremely important in Hawaiian culture as it represents our mana (power/life force). It is important to honor the land, its people and its legacy. 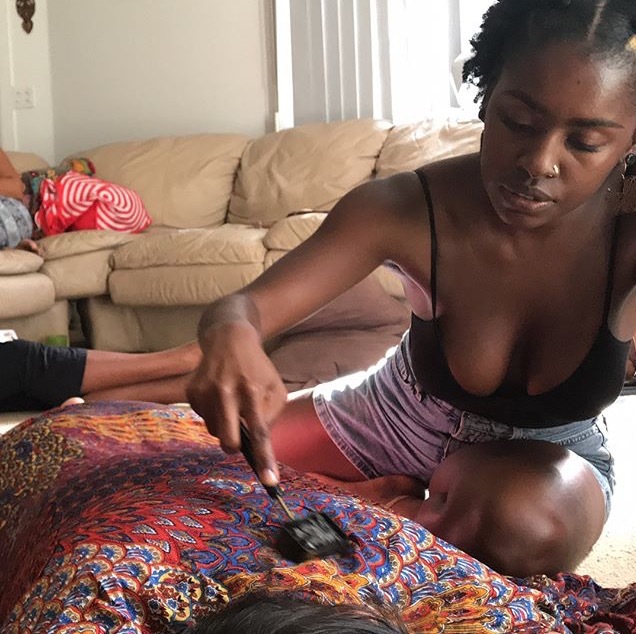 The Remembering workshop covered practical skills and knowledge such as how to tell the gestational age of a baby without measuring tape and the position the of the baby to detailed instructions on how to care for the birther during the sacred 40 day postpartum period. It is important to remember to look at pregnancy with a holistic approach. From pre conception to the postpartum year, each stage is as sacred and magnificent as the last (even when it doesn’t feel that way). Our current state of birthing is so far off course and removed from its original purpose. To transform, transmute, give hope, reaffirm resiliency and bring us back together. Learning from these brilliant women, I am excited for what the future brings to the birthing world!